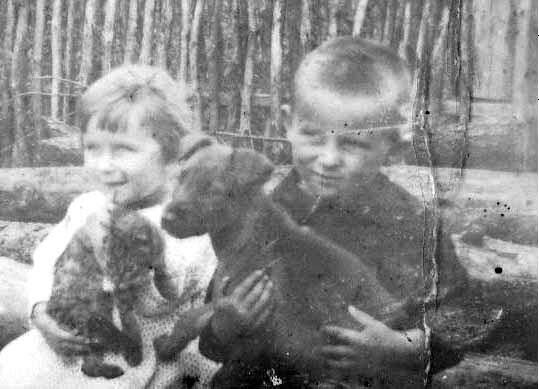 I was born on the 2nd June 1934 near Lwów in a village called Gruszów in Poland. 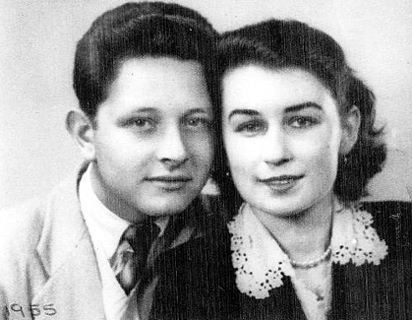 My Father was Michał Skiba and my Mother Helena Pełka. The first 6 years of my life were very happy and care free. In 1939 war broke out and from that point my childhood was disrupted. On the 10th February 1940 a group of Russian soldiers, with bayonets fixed to their rifles, came and informed us that we are to be deported. 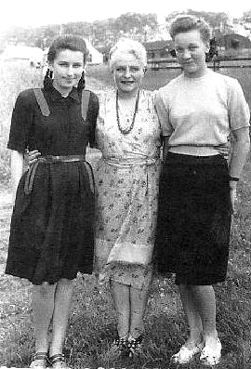 At that time my grandmother Paulina Pełka was with us as my Father Michał, who worked as a gamekeeper, was in the forest. The soldier said that four people had to be deported from this cottage so if my father did not return they would take Grandmother instead. My father did return and my Grandmother allowed to go back to the village. My mother Helena was given very little time to pack a few things then put us on the sleigh which was just outside the door. 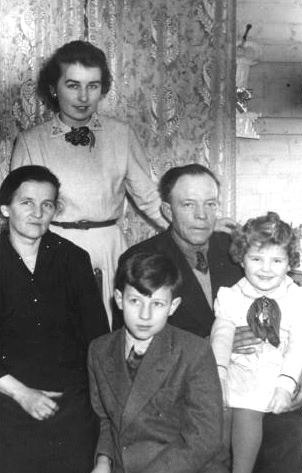 Myself, my father, mother, two brothers 7 year old Stasio and 4 year old Adam and my 4 month old sister Helena were taken to the town hall in the near town. My Mother Helena Pełka and Father Michał Skiba on their wedding day. On the way there we passed my Grandparents' house and by now they knew what was happening and prepared food and clothes for our journey. My Auntie Gienia managed to take little Helenka off the sleigh and keep her with them. All the other villagers were also gathered there. Every Polish person had to be accounted for and then all of us were put into lorries and transported to the railway station. Having arrived at the railway station, we were brutally bundled into waiting cattle trucks, fitted out with wooden shelves/bunks in order to pack in as many people as possible, some 50 — 70 people in one truck. 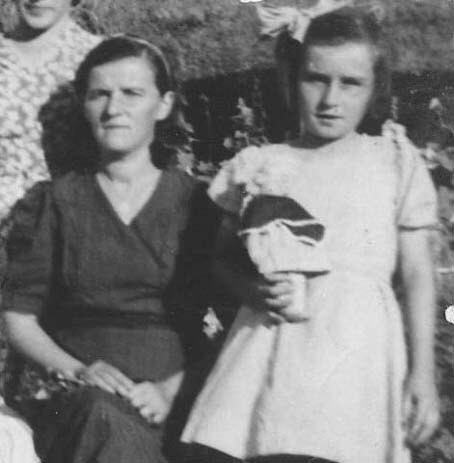 My grandmother was allowed to stay in the village so she took little Helenka with her. 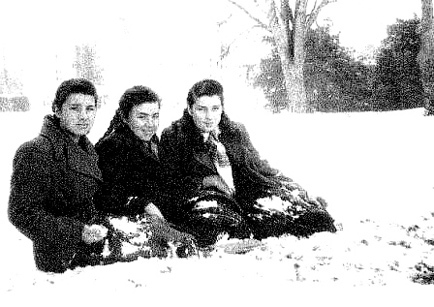 They were also deported to Crimea a year later just like us in cattle wagons and nearly freezing to death. When the wagons were all loaded to overcrowding our journey to SIBERIA began. The journey lasted 3 weeks; it was freezing with no water and hardly any food. Many young babies and older people were dying on the journey. After 3 weeks we arrived at the town of Sverdlovsk and then taken to a small village near a forest. We were housed in a wooden hut which only had a few beds, a table and a little coal stove. Early each morning my Mother and Father had to work deep in the forest collecting pitch resin from fir trees in heavy buckets. They had to visit all the trees in their patch and collect full buckets to be credited with food allowances. They worked from dawn to dusk in freezing conditions for very little food and practically no pay. The over-riding feeling was that of perpetual hunger and fear. At times I was forced to chew on some grass to kill the hunger pains. Malnutrition was evident everywhere. It became so bad that owing to lack of essential vitamins my Mother partly lost her sight and was unable to see after dusk. Every morning I had to look after my younger brother Adaś, dress him and take him to the kindergarten where we learnt to speak Russian and were taught Russian history. My brother Stasio and me. My older brother Stasio went to the infant school and not long after became ill with scarlet fever and died as there was very little medical care or medicines. He was just 7 years old. After a few months of coping with severe frost, hunger, fear, lack of any medical attention, hard work and the inhuman condition in which we lived my Father's health deteriorated, he developed pneumonia and after a few weeks in hospital without efective medication he passed away in 1941. Hope came in July 1941. Due to Germany attacking the USSR on 22nd June l941, a Polish-Russian treaty was signed with the exiled Polish Government in London, and a decree of “amnesty” was issued, allowing for the formation of a Polish army on Russian territory with a recruiting point at Buzuluk, in southern Russia. Thousands of Poles took advantage of this, although not all managed to get out, because news did not reach them in time, before Stalin stopped it. 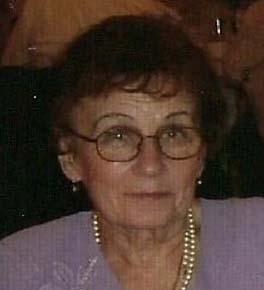 At this time my poor Mother and brother had to bury our father and she could not get help from anyone. Everybody was rushing quickly to get out of this hell. My Mother sold the last of the meagre belongings she still had, to buy a train ticket. We left this hell with all of the other Polish displaced people and our Grandfather Skiba. The journey was dreadful, once again people were squashed into wagons, the train was speeding and was very uncomfortable. When it stopped for a while people could only get some hot water and occasionally a small piece of bread, which was very rare. My Mother had a little money but I would not let her leave the train as I was terrified that she would not be able to get back on it in time. So we all sat there watching other people eating what little they had. My Grandfather got off at one of the stations and did not get back before the train left – we never discovered what happened to him. On that journey my little brother Adaś developed a bad cold and was very poorly but there was no medication available to help him. When we arrived at the destination which was in Uzbekistan they left us under the open sky, the train did not go any further and we had nowhere to go. My little Brother was much worse but a kindly Uzbek woman told my Mother that there was hospital a few miles away and we should take him there. She carried him all the way to the hospital and left him in the care of the nurses then came back for me. This took some time so when we got back to the hospital little Adaś was dead. We were then taken, with another elderly man, by an Uzbek with a horse and cart to his village and put in an Uzbek hut. There was just straw on the floor for sleeping on and a depression in the middle for the fire. My mother had to get up early in the morning to go to work at a building site which was half a mile away. I was left sleeping on the floor as I was not allowed to go with her. They were building a sugar beet factory and it was not safe to bring children there. When I woke up, always feeling hungry, dressed myself and walked to the building site. Many times I was chased by hungry dogs but always managed to get away. I sat on concrete steps outside the site cold, hungry and crying waiting for my Mother to finish her shift but no one took any notice. The guards with rifles stood outside the gates and did not take any notice. At lunch when the whistle blew the workers went to the canteen for a bowl of watery soup, I was allowed to join my Mother and share the soup with her. Sometimes when I walked to the factory I use to pass through a market where the Uzbeks were selling farm produce – butter, milk, spring onions, dried fruit and vegetables. I did not have money to buy anything so I used to crawl under the stalls and collect anything that fell off. I was very careful that no one saw me. I was always cold and very hungry. There was another family close to us with two boys and a girl my age. One day they decided to go to the mountains near by to look for turtles to supplement our meagre diet, so I went with them. It was a dangerous endeavour because under the rocks where we were supposed to find the turtles there might also be poisonous snakes. The boys found one each and I also found one. Wanting to find another one I put it into my knitted shawl on my back. When we got back to our huts there was no turtle, it fell out on the way home. I went to bed in tears on an empty stomach. Some days I and the girl, she was my age pretty and blonde, would go into the Uzbek tea houses where they used to sit on the floor, crossed legged, drinking and eating dried sultanas. Some of them were very kind and used to give us a few sultanas and others were not so kind and chased us out. Many a time all my Mother and I had before going to bed was water . We could not have survived if it was not for the amnesty which allowed for the formation of a Polish army on Russian territory which was organised by General Anders. 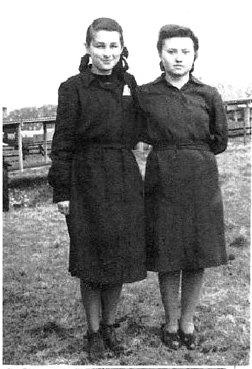 The army was being formed in Kermine and the families of enrolled soldiers were issued with train tickets to join them. We did not have anybody in the army so we had to find another way to get to Kermine. We got on the train without tickets and hid when the conductor came to check. When we arrived Kermine we were not allowed onto the Polish army camp so we found a shady tree very near the camp and stayed there for few days. I used to wonder whether some kind soldier would give me some soup. My Mother spoke to one of the Polish soldiers to find out if there was any way we could leave with the registered army families as we did not have anyone in the army otherwise we would have to stay in Russia and probably die. The kind soldier registered us as his sister and niece. 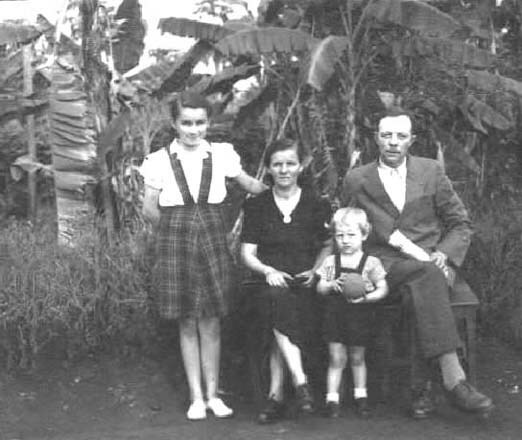 The families had to be resettled somewhere as the army was leaving to join the allies in the war against the Germans. We went from Krasnovodsk (now Turkenbashy) a port on the Caspian Sea. There we boarded a ship where we were exposed to more appalling conditions. The ship was small and we were squeezed practically like sardines. Sanitary conditions again were almost non-existent. There were only four toilets on board, so with people and children suffering from dysentery and other stomach disorders, it simply was impossible for everybody to avail themselves of toilet facilities. We docked in Pahlavi, port Pahlavi, in Persia (now Iran). In due course, my mother and I, along with thousands of other children and their mothers, were moved to Ahvaz on the Persian Gulf. From Ahvaz we were transported to India, outside Karachi (now Islamabad part of Pakistan). In 1943 we were shipped, across the Indian Ocean, to South East Africa arriving in Port Mombassa. On arriving in Mombassa, we were loaded onto barges and taken down several waterways, and then by road, ending up in Massindi, not far from lake Albert, some distance from Kampala, in Uganda. Near Massindi large camps were specially built to accommodate the Polish civilians. The sites for these camps, and many others throughout South East Africa, were chosen by representatives of the Polish Government in London, and we were to stay there until the end of the war. We were allocated half a mud walled hut with a straw covered roof with nothing inside but wooden beds on a mud floor. The cooking stove was outside with just a roof for cover. Toilets were a little further from the hut – just a latrine. The camp was 5 minutes walk to the jungle, there were beautiful flowers, banana trees, papayas with marvellous birds and butterflies. The weather was mostly tropical, hot and sunny but with violent thunderstorms quite regularly. One day there was a rumour that the local Africans were coming to chase us away or kill us because they did not want white people on their soil but nothing happened. 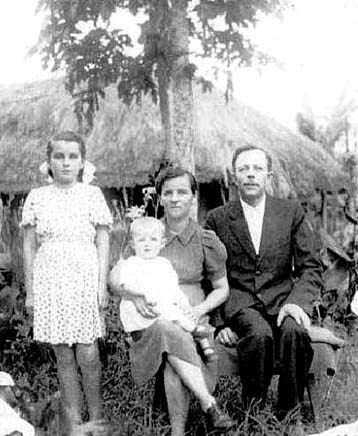 1946 Massindi camp in East Africa me, my brother Adam, Mother Helena, and stepfather Franciszek in front of our hut. 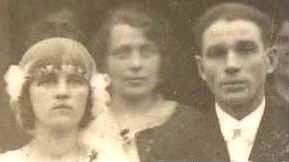 In Massindi my Mother met my Stepfather Franciszek Silarski, his wife died in Siberia as well, and his three sons Janek, Kazik & Tadek were in the Polish Army fighting in Italy. They were married in 1944 and I was very happy, he was very kind. My step brother Adam was born a year later in September 1945. One day she left him in his crib and went on with her chores. She did not notice a little monkey sitting on the straw roof. A few minutes later she heard my brother screaming. When she went back inside the monkey ran away and my brother’s face was covered in blood. It bit through the skin on his forehead wanting to carry him away. The Doctor said when he stitched the wound that he was very lucky, if it had bitten the eyes he would be blind, if the nose area he probably would not have survived. We stayed in Massindi for 5 years which I enjoyed very much, made lots of friends, there were 6 girl friends, we got on well and we played together in those long sunny evenings after school. I finished 5 years of schooling when news came that WW2 in Europe was now over and families who had relatives in the Polish Army in England could join them there. My stepfather had three sons in the Polish Army so we were allowed to join them in England and were issued with travel documents. On leaving our camp near Massindi, Uganda, we were taken by coaches to Kampala, from where we travelled by train to Nairobi (having slept on the platform waiting for a morning train), then on to Mombassa where we boarded a ship called “ SCYTHA ” together with 490 Polish displaced persons. We sailed via the Indian Ocean, the Red Sea, Suez Canal the Mediterranean and the Atlantic, we docked at Liverpool on the 15th August 1948. From there we travelled to a transit camp in Daglingworth near Cirencester, from where we were transferred in 1948 to St Mowgan hostel near Newquay Cornwall. This was a very picturesque area with lovely sandy beaches. I continued my education there. After a few months we were again reallocated to Fairford in Gloucestershire in 1950. My stepfather was assigned to work on a farm in Purton near Swindon and only came home at weekends. I had to fill out many forms to continue my education and, as I was under 16 years old and did not speak English, I was put on a very long waiting list. At the time I was only 14 years old but tried to earn some money as my stepfather was not earning a lot on the farm. So in the autumn we went to pick potatoes on nearby farms for a few pennies. 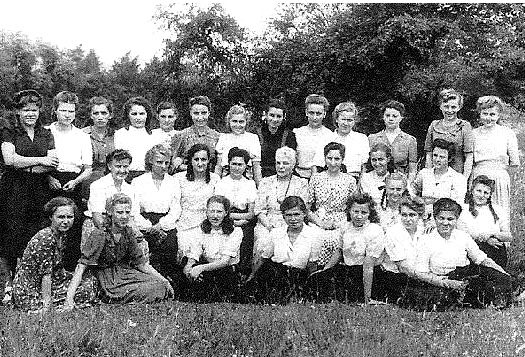 When I was 15, I was admitted to a Polish Girls Secondary Modern Boarding School at Stowell Park near Northleach not far from Cheltenham. Here I spent a year and learnt a bit of English as well as Polish and English history. My class in Stowell Park school. I am on the back row in the centre in a dark dress. After a year at Stowell Park I came back home to Fairford hostel to join my family. At that time my Mother was expecting my younger stepsister and we had very little money so I decided to look for work. It was quite hard to find any employment as I was only 16 and only able to speak a little English. Living in a camp with no transport to get to a larger town we decided with my two friends to get on our bicycles and went looking for work near the camp. Near the camp was the village of Quenington near where we found a cleaning job at Hatherop Castle School. They required someone to clean the student’s bedrooms and serve meals in the dining room. All three of us were employed. We had to cycle the 4 miles from the camp to the school and start at 9:00am working till late evening 6 days a week. Some days we had to stay overnight, all for a wage of £1 about £20 today. Outside the castle with my friends. On the other side of Fairford was an American Airbase and they were recruiting people to work in the NCO Club and were paying £4 a week. The work was hard initially, washing mountains of dishes. Then after a while I was moved to serve behind the counter which was much easier. I used to cycle from the camp to the base, a distance of about 3 miles working on different shifts. I got used to the work but hated the late shift when I had to cycle back home at midnight passing through Fairford village and two cemeteries. I was happy because I could buy my own clothes and help my parents financially. I worked at the base for 5 years until I met my husband Stanisław Przełęski whom, for some reason, I nicknamed Zbyszek. We courted for 3 years and married when I was 21 on the 4th February 1956. Two years later my son Leszek was born. 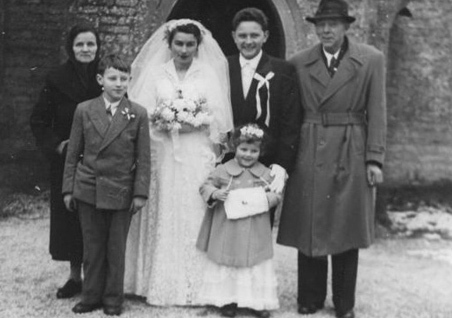 The hostel was closing down and most of the people were re-housed in Swindon so we also moved, in July 1958, to our own house – Leszek was then just 4 months old. We bought a house, on then a new Lawns estate in Swindon. We did not have enough money for the deposit so had to borrow money from my mother in law and a friend Mr. Gąsienica. He lived as our lodger for a few years until we repaid his kindness. A year later on 19th November 1959 my daughter Lucynka was born. We were very happy having a son and daughter and everything was going smoothly. My husband had a well paid job on an American air base at Brize Norton and life was good to us. 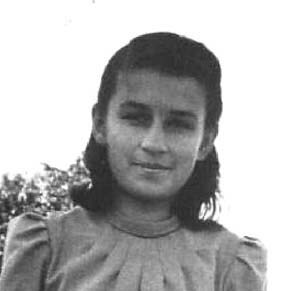 A year or two later my little sister Helena, now 20 years old, came from Poland to be with the family; I had not seen her since she was left behind in Poland when we were deported to Syberia. We introduced her to our friends and the way of life in England. We went to many outings and dances, she joined the local youth centre where she met Krzysztof whom she married. My husband worked, under stressful conditions, as steward at the newly opened Polish Centre but did not earn a lot. Our lives became difficult. I had to contribute to almost everything; mortgage, household bills, housekeeping and looking after my children. I had income from two jobs but even that was not enough. We had spare rooms so I took in paid lodgers and did their cooking and laundry – there was no other way of keeping going. I did not want the children to suffer or worry about our problems. At the time I was working in a grocery shop, the money was not very good but it was convenient as I could drop off and pick up my children from school. I was very grateful to my Mother (Helena) who helped me out a lot, looking after the children when necessary and my brother (Adam) who never refused to help. I subsequently was employed by Russell's Pharmaceutical Laboratory working in the I.D.I Department where the work was interesting, clean and in pleasant surroundings until retiring. 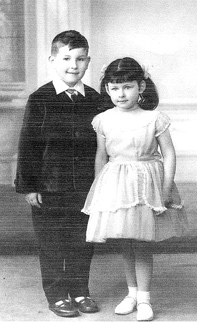 Both my children Lucynka and Leszek never left Swindon, they were always at my side and are now living a very happy life with their own families. Since retiring I have been busy helping in the Polish Community Centre and enjoying my life.